Shuang Shuang, the Chinese hotpot restaurant married to a conveyor belt, befuddled many of its Chinatown neighbours when it first opened. 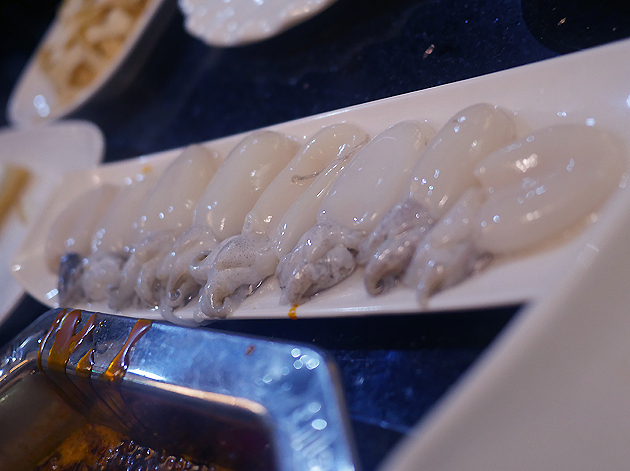 Comparatively expensive with somewhat unadventurous ingredients, a bit too much logistical fuss on your part and a relative lack of large communal pots for group dining, it broke all the Chinatown hotpot rules. 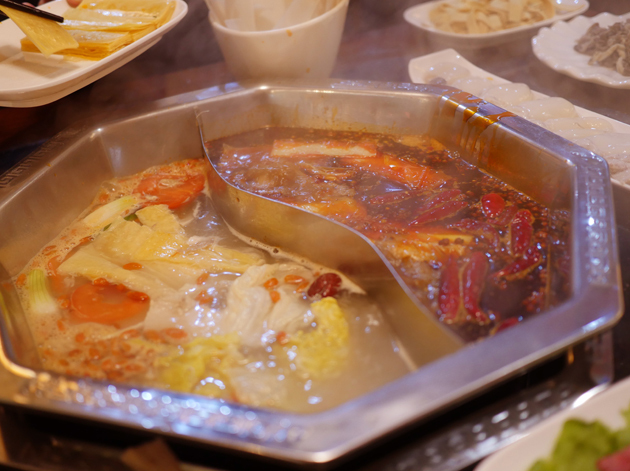 Shuang Shuang’s continuing popularity makes sense once you realise who it’s aimed at – Londoners and other Westerners, either lone diners or couples, who’ve never had hotpot before. Reasonably friendly service, modern décor and the approachability of its conveyor belt system all more than make up for its perceived flaws in the eyes of its neighbours. Shuang Shuang’s mirror opposite is the nearby Shu Xiangge. The second branch after the Holborn original, it makes precious little effort to attract Western customers. Never mind the fact that there’s no menu in the window, they don’t even have a website. Their business card instead has a QR code that links to their predominately Chinese-language WeChat account. Service is little better than the brusque Chinatown standard, occasionally lapsing into uncharacteristic inefficiency, such as failing to top up your boiling pot often enough with fresh water. Then there’s their curiously ambiguous reservations policy. Despite claims in heavily accented but nonetheless clear English over the phone that they only accept reservations for groups of six or more, my Chinese-speaking and -literate dining companion Rodan spied several entries in their reservations book for tables of two and three. A misunderstanding or something more objectionable and insidious? It’s currently impossible to tell. There’s no concept-explaining hand-holding on this barely bilingual tickbox menu – heck the poorly chosen English font is downright hard to read. Whoever designed Shu Xiangge’s menu does have an admirable fondness for offal though – a fact that will put off those of us that have shamefully forgotten the long history of tripe eating in this country. The choice of Sichuanese broths is deliberately small. The ‘beef fat red oil’ default starts out ticklish and tingly, before revealing its fiery, cough- and sweat-inducing colours. It’s therefore worth having the two broth, split pot option. The second ‘bone/mushroom soup’ option was subtly sweet and creamy which made for a welcome occasional respite from the beef fat broth’s incandescence. The ‘extra hot’ variant must be a veritable beast of heat and spice. Dried bean curd skin is just visible in the upper left hand corner (I otherwise don’t have a photo of that one). Firm, wrinkly beef stomach was not only a textural delight, but easily took on the qualities of the broth it was cooked in. 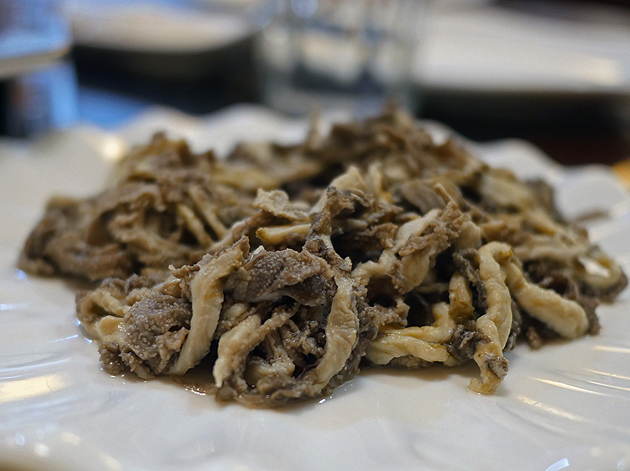 Beef tripe was much the same, except it had a decidedly funky turn to it somewhat reminiscent of blue cheese. It’s a real shame that tripe has largely fallen out of favour in modern Britain – it’s inexpensive with a sumptuous mouthfeel and effortlessly takes on the flavours of whatever it’s cooked in. Possibly the rumen part of the bovine stomach. Possibly from the abomasum part of the bovine stomach. Even routine offal guzzler Rodan was taken aback at the sight of the ox calves’ brains. The Euro Hedgie was stoically unmoved by each mouthful, but I was taken with the profoundly soft, creamy charms of this grey matter. A bit like foie gras with a hint of butter, the tinge of fiery heat from the spicy broth proved surprisingly complimentary. I heartily recommend them. Worry not. 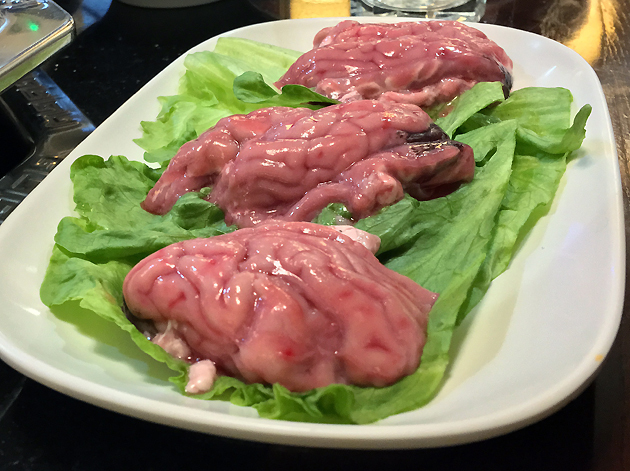 Brains from calves and sheep aged 12 months or younger have been ruled safe to eat by the Food Standards Agency. 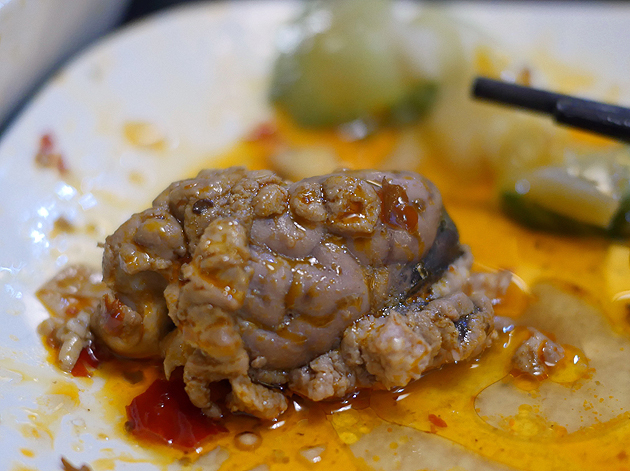 Don’t overcook the brains – they can shrivel in size quite dramatically if left in the hotpot for too long. Many of the less eye-catching ingredients are no less exemplary. To go well with the powerfully-flavoured spicy broth, most had neutral flavours but with intriguing textures. 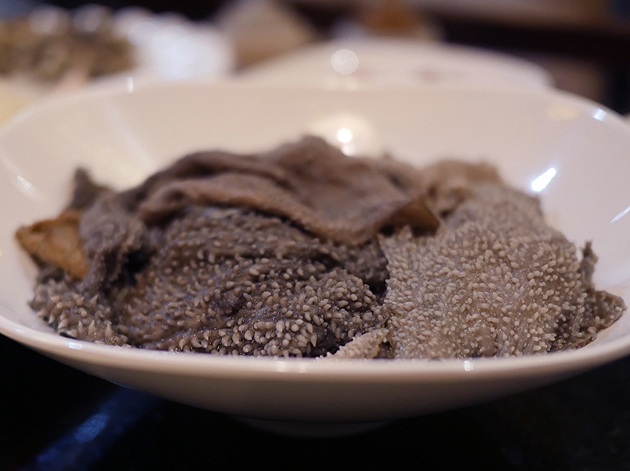 Baby octopus was firm and springy, while Chinese yam was starchy and yieldingly soft. 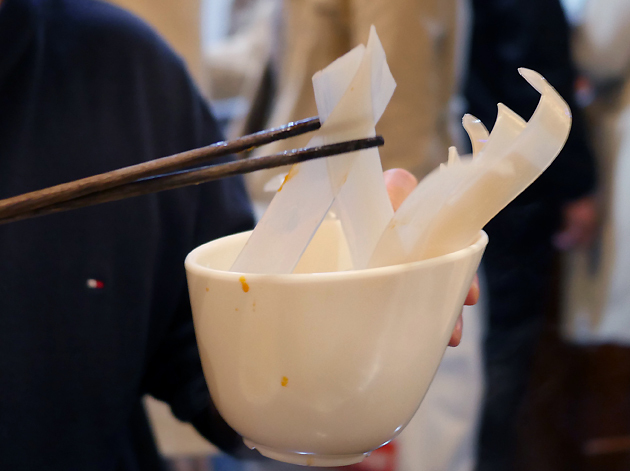 Dried bean curd skin was thin and smooth, soaking up and then releasing the unexpected umami of broth broths. Fresh bean curd was not only adept at soaking up and releasing umami, but had a truly superlative mouthfeel too as it came in dimpled noodle-like strips that tickled my tongue. A small range of dipping sauces are available – sesame paste is a good option, both because it’s inherently flavoursome and because it compliments almost everything. Beef aorta reminded me of pork stomach with its thick and smooth flaps, quickly becoming tender in the broiling broths. Like the other offal here, it neatly absorbed the flavours of each soup. A cheeky move by the restaurant management – using a bed of cabbage leaves to make the amount of food on each plate look bigger than it actually is. A canny Instagram-focussed manoeuvre. 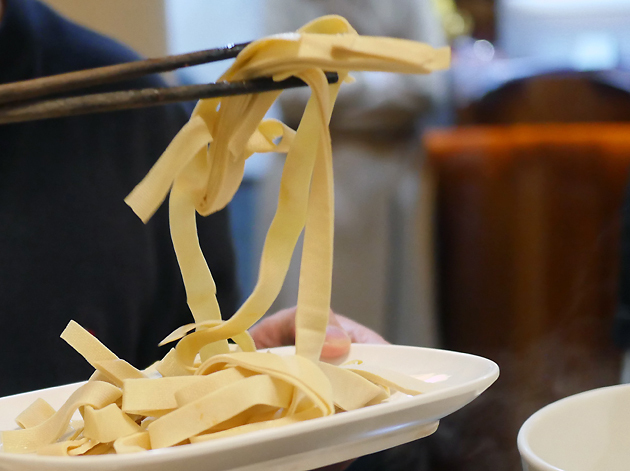 ‘Crystal’ noodles, probably made from rice or mung bean flour, were thick and wide with an addictive elastic chewiness. 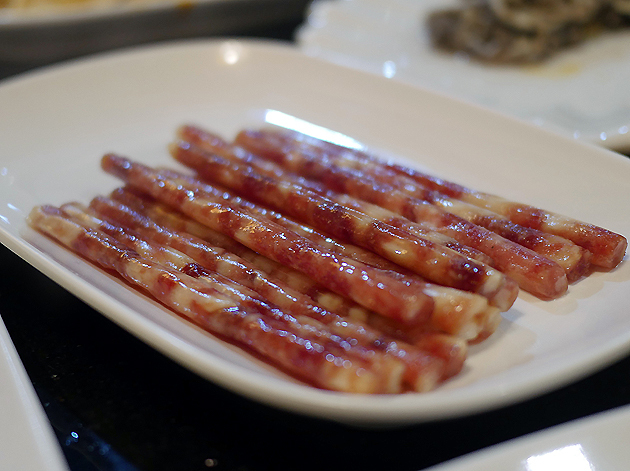 The only duff hotpot ingredient of the night turned out to be the thin and tall Chinese sausages. More fat and sugar than pork and salt, they were disappointingly unbalanced. Most of the photos depict the various ingredients in their pre-cooked state. Soz. I find your fatty meatstick disappointing. While waiting for your broth to boil and for your chosen ingredients to cook, it’s worth snacking on the dan dan noodles. 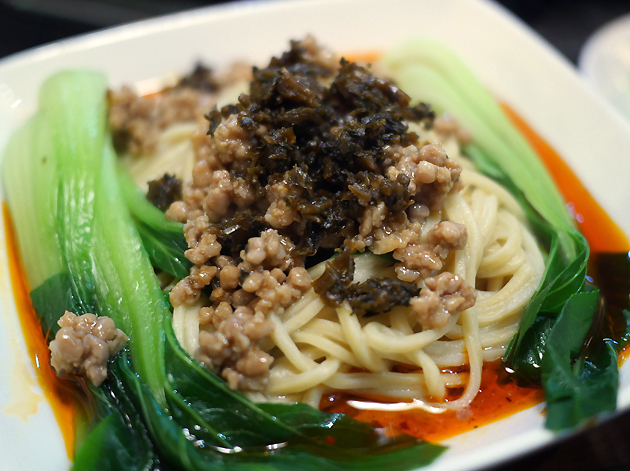 The soft yet supple noodles had a numbing heat coursing through each strand, with properly meaty mince and not-too-soft bok choy providing quality backup to the Sichuan pepper-derived heat. Pro-tip: order a big bottle or two of soya milk. Its soothing, cooling charms will balance out the lava-like heat of the hot broth. If my reviews were based on quality and price alone, Shu Xiangge would get an unconditional recommendation. Despite stuffing ourselves until we couldn’t move or see, my posse of three paid just £40 a head with soft drinks – far less than what you’d pay at Shuang Shuang. And yet the iffy service and darkly suspicious reservations policy leaves a bad taste in my mouth that lingers on long after the taste of pungent chilli and offal has passed. If only Shuang Shuang’s food was as delightful as Shu Xiangge’s, then I’d never have to put up with that kind of nonsense ever again. As it stands, I’ll have to stomach their tripe if I want delicious stomach and tripe hotpot. For now. Reservations: who knows – maybe one day they’ll get their story straight. Tags: bean curd, brains, hearts, hotpot, london, noodles, octopus, offal, restaurant, review, sausage, shu xiangge, sichuan, squid, tofu, tripe. Bookmark the permalink.